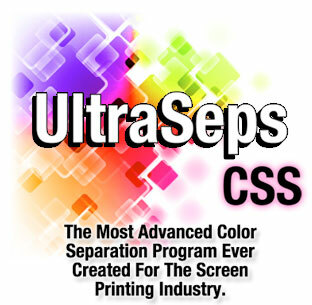 UltraSeps CSS, now in its second version named UltraSeps v2 is the big brother of QuikSeps Professional which set the standard in color separation software for t-shirt screen printing. 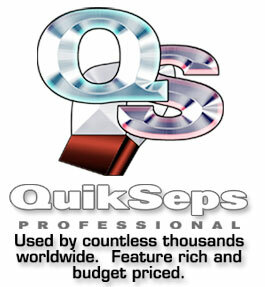 Released in 2009, QuikSeps Pro was our 4th. version that was originally introduced in 1999. Our software has a global user base approaching 9,000 t-shirt screen printers and graphic artists, is used by most of the largest apparel manufacturers in the world and is widely considered the finest available. UltraSeps v2 offers everything the original UltraSeps and QuikSeps Professional does yet takes them to the next level by including an immense array of enhanced and expanded features, advanced automation along with new and additional color separation functions and techniques. Its basically like the original UltraSeps and QuikSeps Professional on steroids! UltraSeps features a completely new second and third simulated process color separation programs called Simulated #2 and Simulated #3. That's right, UltraSeps includes three completely different simulated process color separation programs plus the finest CMYK, Index, Grayscale, Spot and Specialty Color Separations available. All have been enhanced and improved for optimum performance and ease of use. Additionally, UltraSeps v2 includes increased ease of use and this is probably the most important single improvement when compared to our previous version of UltraSeps. We've removed just about every possibility of error from UltraSeps v2. The program includes logic that examines your file prior to running a separation and most other functions so even if your image is formatted incorrectly for use, the separation is generated or file is processed. For those looking to get started in color separation and also needing to save a few dollars, by all means consider QuikSeps Professional which is now the second-best color separation program available for t-shirt printers. However for those who demand the very best to gain an edge on the competition, then UltraSeps CSS is the logical choice. UltraSeps v2, the most advanced color separation program ever developed for t-shirt screen printers. Visit our websites today and decide which is the right program for you.